Billy Waugh (Shawn Fisher) – A special operative and guide provided by General Legend. Special guest star! Arc Light – hacks the planet and gets a link into the comm station. Zephyr – back up to Arc Light, perimeter defense for that part of the mission. Rat Queen, The Commander, Billy – initial perimeter recon. Goal is zero residual presence, no detection. If you have to choose between breaking contact and not looking in a particular window, break contact. Eamon – scan base for underground surprises. We re-convene near the Comm shed. What Comm shed? Oh: that comm shed. With Arc Light hopefully all in they face with the communications in and out, we put a contact team in the barracks (I’d say Billy, Ian, and . . . who’s the next sneakiest? Not the guy in the battlesuit, I suspect) and down the guards there. When that’s done, which whittles down the opposition by half or more, we then all converge on our scientist quarry. Ideally, we have a noisy group that will be the hammer, and the quiet group that’s the anvil, and drive him into our waiting clutches. Then we throw down a monster diversion – remotely firing up DA CHOPPA as if we expect to exfil using the CH47, for example – but we actually sneak out through the floor, using Eamon and TRQ to literally make a hole. At that point, The Commander and Billy can play rear guard, Zephyr and Arc Light keep our mysterious scientist nice an quiet. We emerge farther down the mountainside and Eamon floats us down. Billy takes point then and we disappear into the jungle, and then get back to the USA. So that’s where we are, now we see what monkey wrenches are thrown in. We set out, and the first thing we do is take down the guards on the east side of the field. The Commander quickly moves in, spends Fatigue, and does a move-and-attack and a flurry of blows, and takes down the two closest guards, while Billy uses his .300 Blackout (with super-suppressor) to down the guards midfield, and takes out each one with a shot to the eye. So the two supers neutralize the opposition on that side that we can see. That’s more contact than I was looking for early on, but there was really no way to do this without contact. Arc Light taps into the comm shed, and owns their communications network in short order. Billy and The Commander and Yukio head directly to the wall – The Commander warns Yukio that if he gives us away, no snacks. Yukio bolts across and then pops claws and starts climbing the wall. Overachieving showoff. We check out the window, and it’s a foyer. Biometric locks, but Billy can see that it’s a handprint scanner. The Commander burns 5 karma to turn a natural 18 Tactics roll into biometric information dump that Arc Light feeds into their system, giving us access to the place. We continue to look into windows and stuff. Yukio dispatches two guards, silently, and drags their bodies into the shadows. He’s doing “barkour,” nimbly leaping across rooftops. He continues “working” and piles up eleven bodies in the niche. We see a few non-guards in the mess/lounge. Hmm. We send The Rat Queen northwest to neutralize the barracks, and that goes off as planned. The only bad guys we have to face are in the facility itself. Eamon reports there are no hidden passages, nor underground basement, with his gravity sense. There are quite a few personnel – over 30 – and we sense construction similar to a prison cell, and made of an advanced carbon fiber material. The Commander deduces that they brought it in by air as prefabs. Eamon starts to scan and actually gets nosebleed scanning an internal part of the base, as if physics and dimensions have been broken in that area. We turn around, and see Eamon the flying lawyer hurtling to the base – and Total Eclipse of the Heart starts playing over the headphones on our personal frequency. We hear, in tones of mind-bending horror “Find me. Free me. Restore me.” Eamon’s heading right there. OK. so much for the plan. The Commander blows in the wall and Billy dashes in, he sees our Quarry in Cell 2, and a guard down the hall. The guard is quickly dispatched with a bullet to the knee, because this is GURPS and not Skyrim. Sort of. There are two unoccupied cells, and the Engineer is in Cell 2, so Billy goes in to get them. We’ve turned the building into swiss cheese, with many holes in many walls. We go full-on murder-commando. Zephyr throws in five grenades into the lounge, turning the nine people in there into gazpacho. Well. Boom. Arc Light electrifies the comm shed, rendering all within unconscious. He’s going for tapping into the data that the comms are sending and receeiving. They’ve got some pretty fancy satellites in orbit, and they’re sending this data – live data – to somewhere else. The encryption is really really good, though. We have rapidly removed all opposition but in the R&D lab. 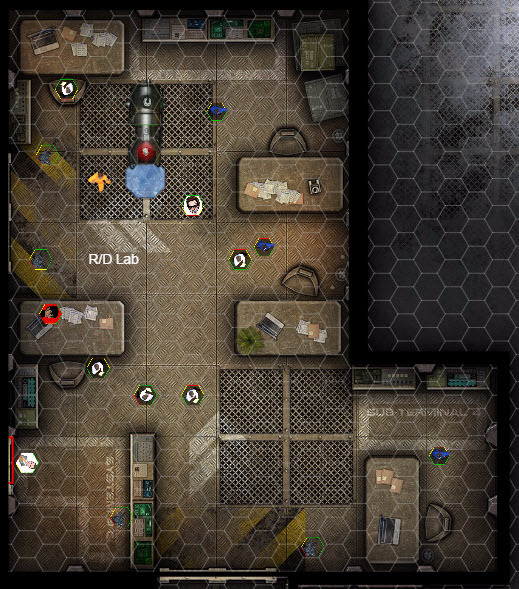 Zephyr goes into the second-to-last unscoped room – and discovers trouble. Big trouble, in the form of a giant mecha. With giant guns. He tries to shoot at Zephyr, but crit fails, and we have an ED209 moment – he kills the techs in the room. Zephyr dodges, and instead of getting hit by 9 bullets, gets hit by two. 9d6+2 (2) to the torso. He takes 39 points of damage, even through armor. 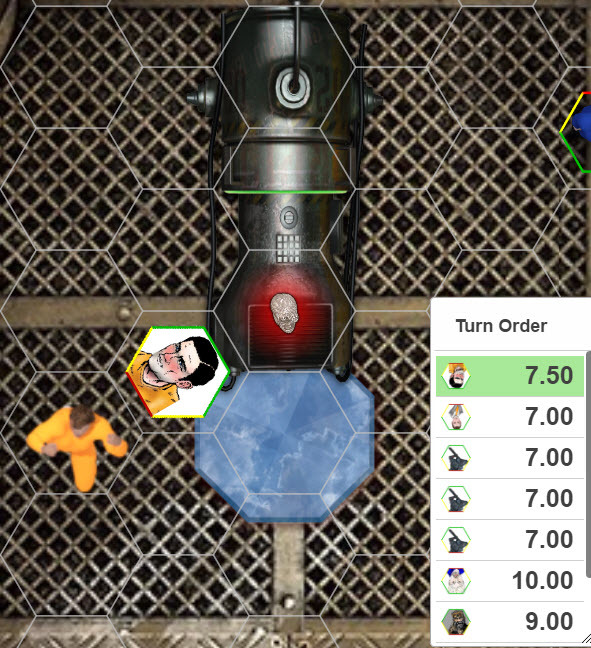 The Commander runs down the hall and fires three mega-super-bullets at the now-shielded Giant Robot (SM+4). 6dx3(10) vs ultra-tech shields. Damage rolls 63, 75, 60. With an AD of (10), this could be OK, but that depends on the quality of the force shields. Over in the R&D lab, we have a bunch of combatants. 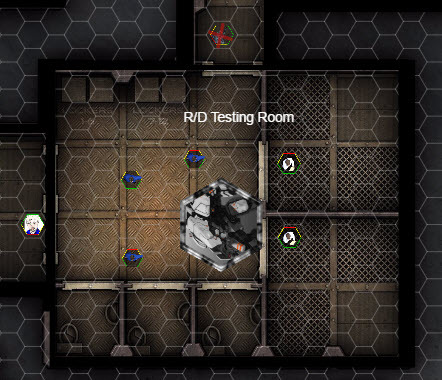 Down in the R/D test lab, Zephyr’s insides are on the outside. Billy does his thing and discovers the robots weaknesses. There’s a weak spot that will let us take it out in the sensor area, but we have to ablate the shield with massive firepower. The special bullets actually penetrated the shield, so The Commander tries again. He hits five times, with “special” bullets, and even manages to hit through a power defense. But it looks very, very mad. The way robots with giant guns doing 9d(2) damage do. It runs past Zephyr, and totally unloads a minigun or something at him as it passes. Zephyr wisely spends karma to avoid being totally perforated. Dr Jones, Meet Yoric . . .
We note that the machine in the middle of the R/D lab is a crystal skull. Arc Light decides to grab it and smash it. We universally decry this as a terrible idea. Arc Light grabs it, rips it out of containment. It starts pulsing, and starts giving off energy waves. The scientists start getting ripped to shreds, Arc Light’s armor starts dissolving, and he and his armor disappears. Only dust remains. Every person in the building that isn’t a metahuman . . . dies. Our TacNet is down; it was tied through Arc Light’s computer. Zephyr spends karma like it’s going out of style, and gears up for a lightning bolt – he’s going for a super-surge static electricity attack with an armor divisor at 6dx9 or something. He actually makes the robot explode. But he’s in range of the explosion. Acrobatic dodge out of the radius? Yes! And closes the blast doors, which contain the explosion. 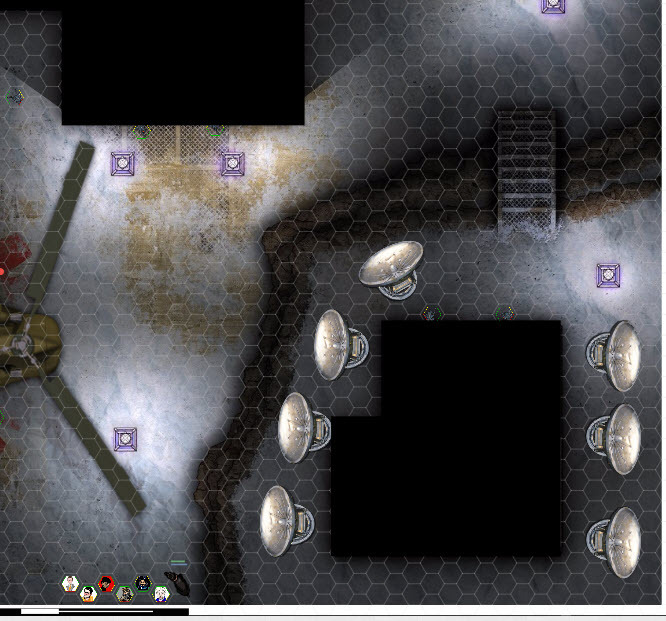 That takes us out of combat time, but we still have a nasty red glowing crystal skull in the middle of the room. Eamon’s Hidden Lore skill comes into play. A legend he thought was false, about 13 crystal skulls. Those that get ahold of them gain immense power. Some are portals to other times and places. All have some sort of personality inside them, and they judge you. Billy actually had a secondary mission – and there’s yet another guy here that Billy was supposed to get. Zephyr talks to the skull, which allows Zephyr to pick him up (!). It looks to be made of a single piece of crystal (quartz, perhaps). It is emitting pure kyberian energy. We try and lift the containment machine, and the skull shrieks out “I will not be contained!” Billy, and The Commander stay conscious by making will rolls; Eamon and The Rat Queen spend Karma to stay conscious; Zephyr passes out, and Arc Light has been disintegrated, so there’s no change for him. The Commander stays awake out of sheer determination to tell the rest of the team “I told you so” after tis. The skull naturally floats to me. I say “OK, Yoric, what do you want?” I feel it rummage through my memory, and then deactivate. Things are OK for a bit, then I feel an immense pain, which I sustain through a good HT roll (and HT 16). We do a quick intel sweep, then grab everything we can, which winds up to be everything. We zip-tie all the survivors, get the Engineer, and out. We load into the CH47 and fly off; Eamon gives a few nudges to the mountain as we go to implode the base, and bury the base under a landslide. So, when we land on the ship, General Legend is there. Also there, uncloaked, is Basilisk, General Legend’s sister, sniper, and heal-bot. With them standing next to each other, they definitely look like twins. “Did you know they had a skull,” Zephyr says without pause, and with a great deal of rancor. Legend looks surprised. “Where is it?” Basilisk has tears in her eyes; she goes over and hugs the scientist on Billy’s want list. They talk together in a language no one understands but Shawn. More thoughts on this later. It’s late and I’m tired. Previous Previous post: Dragon Heresy – so close . . . The song that was playing over their comms was this: https://www.youtube.com/watch?v=lcOxhH8N3Bo *cackles* When I finally play out the entire arc y'all are gonn look back on this comment and smack me. It will be worth it. Correction: rat queen didn't pass out. I spent like all my karma on that.